It’s no secret that renting equipment can sometimes be more economical than buying, especially for the novice. Even expert skiers will rent equipment when they’re vacationing or when they don’t get many trips in during the local season. You don’t have to rent from the resort, though; check with local sporting goods and ski shops and those around your destination while you’re planning your trip – you’ll probably find some that rent equipment reasonably. You may also be surprised to learn that many resorts offer substantial discounts if you reserve rentals in advance. Check the website of your ski resort to see if it’s an option. As a bonus, using either of these methods will get you to the lift faster when you arrive. Buying skiing equipment may actually save you money if you go often. If you plan to purchase your own skis, boots, poles, goggles, etc. go where the bargains are. Of course, you’ll want to check the classifieds in your local paper and search Craigslist. Watch for swap meets if there’s a local ski club. Look for those specials that come up at the end of the season as well as online specials for new equipment. While this may fit into the category above, it’s worth mentioning separately. If you’re more interested in enjoying yourself than looking fashionable on the slopes, think about wearing what you already have, rather than buying an entire ski wardrobe. If you’ve got thermal underwear and a good winter jacket, gloves and hat, just a decent pair of ski pants will keep the bottom half dry. Borrowing can be a touchy subject, but if you have friends that don’t mind, ask them about gear or ski wear. Just keep in mind that if you end up in the trees, so does the borrowed stuff. Replacing someone else’s equipment isn’t cost effective. Ski lodges are fun places to stay, but if you’re on a budget, you’ll find much less expensive accommodations close to most resorts. You might have to get up a little earlier to drive up the mountain, but you might save enough to extend your trip another day. Besides, you might find something you’ve been missing. The town of Jackson Hole, Wyoming, for instance, has a great night life and plenty of discount motels. Almost any hotel, motel or lodge offers substantial discounts for early booking. A few months isn’t too far in advance to start making calls or checking sites like hotels.com as much as a few months in advance to lock in a better rate. This applies to the resort motels and ski lodges as well as chain motels. 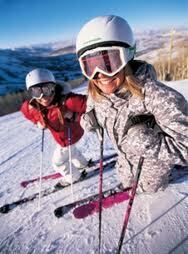 If you’re planning an extended trip, there’s a good chance you’ll find savings on a ski vacation package. High-end ski resorts like Breckenridge or Deer Valley always have luxury packages available, but if you want fun at real discounts, check out expedia.com, snowventures.com or ski.com for some surprisingly good deals that may include travel, accommodations, lift tickets, rental discounts and more. Remember to shop early for these trips, too. Lift tickets can be pricey. Fortunately, there are a lot of ways to save on them. Websites like liftopia.com can save you up to 50% on day passes and their deals are available for almost any ski area. Check out deals at the resorts on 2 or 3-day passes. And of course, if you plan to ski one place often, you should consider a season pass, but do the math to be sure it’s the best deal, and buy before the snow flies, if you can. On day trips, eat a good breakfast before you leave and take along something to snack on, like trail mix. For lunch, enjoy a sandwich or energy bar while you take in the mountain view. If you’re staying a while, find a motel that offers kitchenettes and fix some of your meals in your room. When you choose to have a restaurant meal, try some of the local fare instead of paying ski lodge prices. With all the choices available, a change of scenery can provide less strain on your pocketbook as well as new adventures. Smaller resorts compete with the big guns by keeping their prices lower. For example, in the Lake Tahoe area, Diamond Peak, Mt Rose and Homewood lift tickets can be 30% to 50% cheaper than Kirkwood and all receive great reviews. Remember, variety is the spice of life. Many popular resorts will offer lower ticket prices during the week. Not lonely will this save you some money, but you’ll escape the weekend crowds. Make some calls or look online. Look over this list the next time you get the itch to pack up your ski gear. Saving a few dollars might mean you’ll get in another trip this season, and you might even make it back home with money in your pocket.